The tournament of Kingdom Builder is finishing soon, just a few more games left… see addenda and comments for more details. The league will take place during the end of March and April. The final will be played in May. You can expect to play around 4 sets of 2 games during the league phase and 2 more games in the final. If you register for this tournament, you will be playing approximately one set of games every other week (there is some flexibility for rescheduling a game if you’ve got holidays planned). The fee to participate will be 2€ for members of the Club and 4€ for non-members. If you want to participate, please send an e-mail to the organiser (David Dominguez) before March 19th. You will receive further details before the start of the tournament. If you know of someone who would be interested in playing but is not a member of the Games Club or has not yet participated in any of our tournaments, please feel free to forward him/her this email. If you want to try Kingdom Builder before registering, please inform the organiser so some demo games can be organised. If you have any questions about the tournament, just send an e-mail to the organiser. Please be so kind to transfer the participation fee with your name and mentioning Kingdom Builder Tournament 2013 in the comments section. There will be 4 rounds. In each round, you will play 2 games with 3 players. Everyone will play against everyone else once (let me know if I made a mistake). You can play the rounds in any order. For the League’s purpose, the Winner will score 3 points and a “Winner”. The second player with most point will score 2 points and the third player 1 point. At the end of the League, the 3 players with most points will play a final. Ties will be resolved looking at the number of “Winners”. If ties persist, additional games will be played to break the ties. Therefore, the final score in each game is not relevant, only the final stands. You don’t need to note the points after each game, only the stands. You can send me an email cc/ing the other players and I will note it. Seating and starting order will be chosen randomly for the first game (I will include one die in the box for that). For the second game, the player that was starting last in the first game will then be starting player and playing order will be reversed so that the player who was starting will be the last to start playing in the second game. We will play using both the basic game and the expansion “NOMADS”. I will include some FAQS in the box. 1) Randomly choose the board composition and orientation. 2) Randomly choose seating and player order. 3) Randomly choose the 3 objectives including also the ones in the expansion. If someone doesn’t find it good enough to pick random cards because of their slightly different backsides, then have someone shuffle and someone else name cards (1-13). Make sure that the objectives are clear to everyone and begin the games! It is possible to play 2 games in ca. 90 min. If you commit yourself to start playing a game, please do not quit before it finishes and leave the other players in the lurch. It will be considered that you lose that game. As courtesy to fellow players, draw your next card as soon as possible and think your play ahead, it can save a lot of time per game! Please consider that most time in the game goes waiting for your turn. If at least two players agree because a game is taking to long, then a timer can be introduced: allow 2 extra minutes per player. As per 24/04, we noticed that there are no tie-breakers when two or more players finish a game with the same amount of points. In those cases, the solution will be the following: a game will always afford 6 points, so players sharing positions will add the points of those positions and divide it by the number of players tied. 1) If all 3 players tie, then each player receives (3+2+1)/3 = 2 points each (and 1 Winner for each too). 2) 2 players (A and B) tie for the first position, then players A and B get (3+2)/2 = 2,5 points each (and 1 Winner too). The last player, C, gets 1 point. 3) 2 players (A and B) tie for the second position, then players A and B get (2+1)/2 = 1,5 points each. The first player, C, gets 3 points and the Winner. We’re dying to see the results of this one. I’ll start publishing as comments the list of people who have paid the registration fee. This way it will be easier for everyone to know whether they have paid or not. Congratulations for the new web page, it looks wonderful! I registered for KB, but not paid yet. Please do not forget me! As this tournament is just starting, could we have it as an sticky post for a couple months, please? Alternatively, David could send a new post so that people subscribed to the website will know that the tournament is starting. 2nd game: Winners David and Antonio tied with the same amount of points. Beni last. 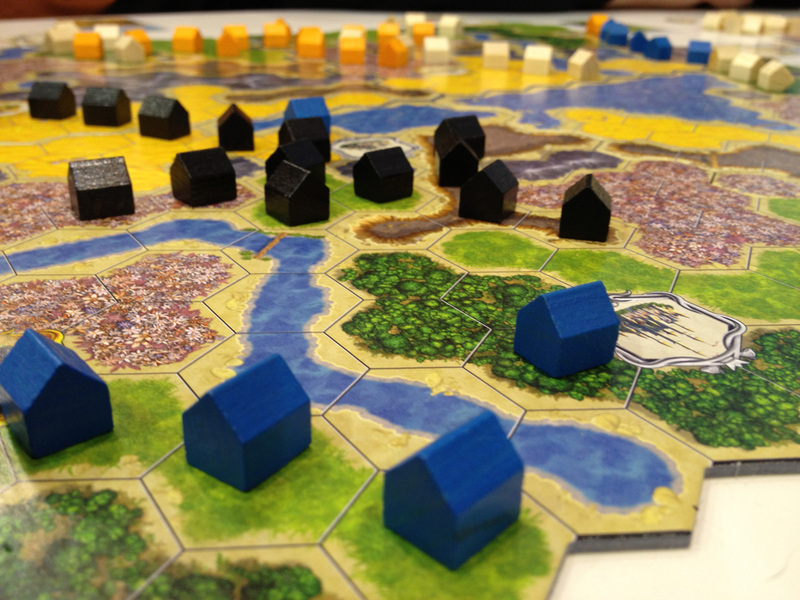 Kingdom Builder has NOT a procedure for resolving ties, the rules state that in the event of several players having the same amount of victory points, all of them are the winners of the game (sic). David will implement a solution for this problem. Game 1: Beni and JL: 43, Daniel 29. Dear participants, the league is over, time for the final!! The first three: Antonio, Daniel and Thibaut will play the final. Thibaut has won 4 games, so he has 4 “Winners” and Renaud has won 3, so just for 1 “winner” is enough to break the tie between them. I’m sorry Renaud, you deserved a place in the final too!